Your stunning gowns are waiting to be delivered! Imagine walking into an event and have everyone turn around and look at you! This is what we aim to do for you through our bespoke collection of gowns online. Be it a party gown or a delicate evening gown, our choices of designer gowns online are custom-made to make you look like the belle of the ball. Our selection includes western gowns fit for New Years Eve and Youngster’s parties, whereas our indo-western gowns are perfect for a Sangeet and suitable for all age types. 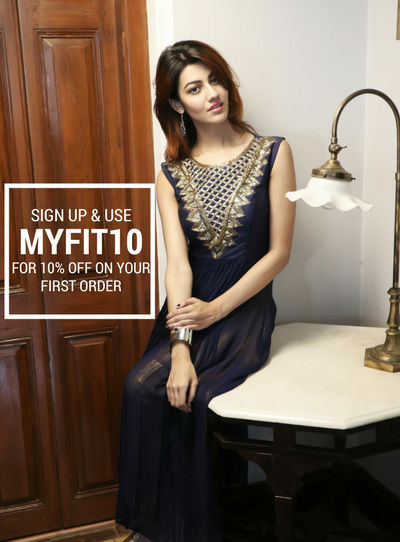 At StitchMyFit, we’re trying to offer you the latest gowns online, so you don’t have to go hunting for them store to store. So if you are looking to buy gowns online, look no more – our collection ranges for those looking for something pocket friendly to those looking for something elaborate for that special evening out. Getting customized designer gowns online has never been so simple : choose a gown online, pick the colour, sleeve length, neckline and drop us a message us in case you would like more customizations. Next step, upload your measurements online and voila, your bespoke experience has never been easier - the personalized gown is delivered right to your doorstep. Who knew that for buying a gown, online shopping is the right way to go?